Italian designer Antonio Marras unleashed a procession of fauvist travellers on the catwalk Friday in a collection dedicated to "those who have still not left and those who are forced to leave". Models wore animal skin motifs from around the world, mingled with delicate translucent fabrics as they walked through a series of wooden doorways resembling airport metal detectors, on the third day of Milan Fashion Week.Enormous hats with plants or butterflies sprouting from them could barely fit through the doorways in a collection dedicated also to French 19th century poet Arthur Rimbaud: "The man with wind beneath his feet." Referencing migration but also Italy's ill-fated 1930s occupation of Ethiopia, the famously experimental and theatrical designer used emotive soul music to heighten the experience. 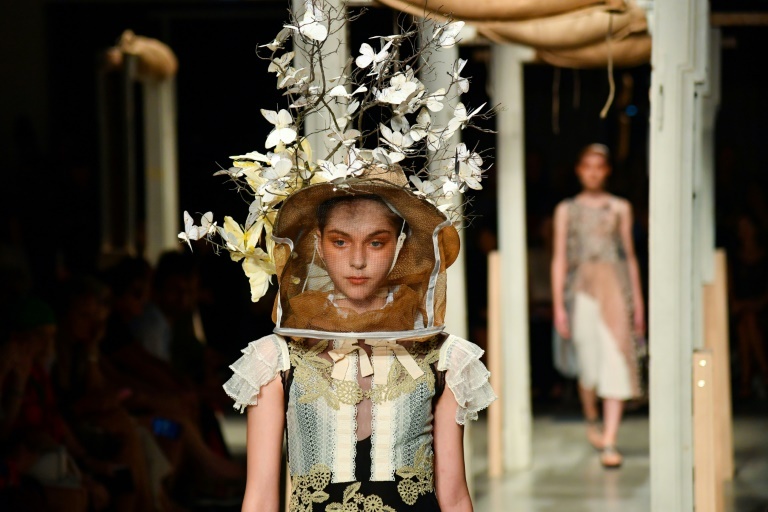 Models wore geographically distinctive dresses and jackets, south east Asian inspired hats, African animal prints and even a nod to US high-school football jackets.Hats resembled those worn by beekeepers for protection, while cheetah and snake skin patterns mingled with gracefully sown flowers. At the climax of a heavily symbolic presentation, a group of men wearing only white Y-fronts with army boots tied around their necks stumbled through the same door frames, embracing each other before cleansing themselves under a shower of white sand. Milan's Etro also took on a travel theme, with surf bum models carrying surfboards and skateboards down the runway as part of the "Pacific Zen" collection.The designs that made Etro famous — paisley, preferably psychedelic — featured large, with floral motifs and Japanese calligraphy printed on baggy silk, crowned with enormous, floppy hats. Etro, which celebrates its 50th birthday this week, deployed lime, mandarin, coral, cream and a smattering of black for this season. The brand is still family run and will launch an exhibition on Saturday about its history. "A good age but especially a starting point for another 50 years," said Veronica Etro, director of the women's and girls collection and daughter of founder Gimmo Etro. 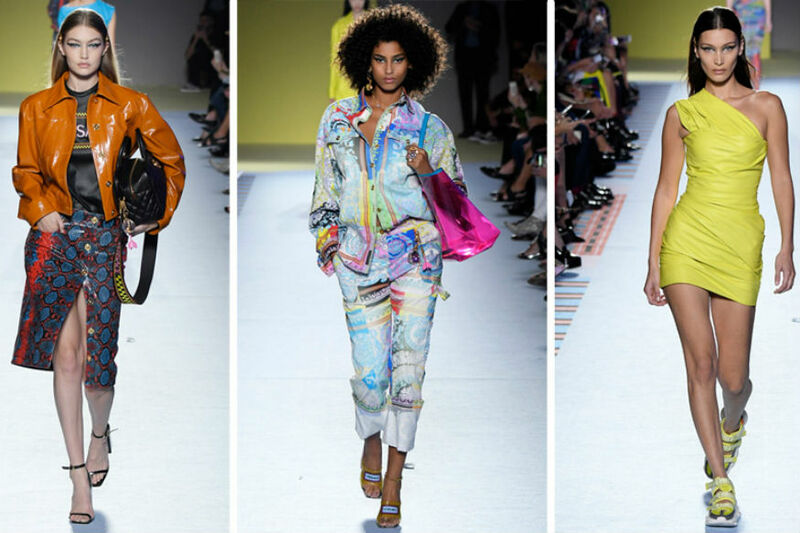 The day concluded with Versace, another Milan designer renowned for its bright colours and popular with Millennials who thronged outside the show. Donatella Versace sent instantly recognisable yet original outfits down the longest catwalk, mingling boldness and sensuality with effortless layering.Skin-tight outfits mingled with flamenco-flared leggings marched along brightly coloured carpet, while a new take on the tuxedo draped bodies in seductive black satin. The brand with the famed Medusa logo said that her "mystic powers and ever-powerful persona are evident now more than ever". Fake snakeskin, flowers, polished leather and layer upon layer, the Versace collection was eclectic and refined.